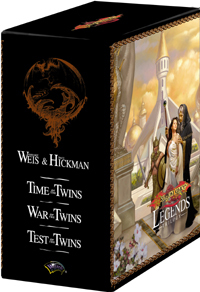 This slip-covered gift set contains three key titles from the Dragonlance saga: Time of the Twins,War of the Twins, and Test of the Twins, all of which were written by New York Times bestselling authors Margaret Weis and Tracy Hickman. These are crucial titles for the shelf of any Dragonlance fan. In Time of the Twins, Tasslehoff, Raistlin, Caramon, and the priestess Crysania travel back in time to visit the city of Istar before the Cataclysm in an attempt to avert disaster, while Raistlin plots to seize the magical power of the ancient wizard Fistandantilus. In Test of the Twins, Raistlin casts a magical spell to open a Portal to the Abyss. At the same instant his brother Caramon operates a magical device that throws Caramon and Tasslehoff into an unexpected place. And in War of the Twins, Raistlin prepares to enter the Abyss and challenge the Dark Queen herself, only to discover that he is caught in a time loop from which there seems to be no escape. Trilogien handler om tvillingerne Majere og selvfølgelig er de ikke foruden Tasselhoff som altid er med når der sker noget, samt en præstinde ved navn Crysania. Raistlin har planer om at overmande mørket og bringe det under hans kontrol og søger efter magt. Caramon, Tasselhof og Crysania tager til bage i tiden, hvor Caramon forsøger at ville redde hans brors sjæl. Raistlin får åbnet portalen til "the Abyss" og vil udfordre selve mørkets dronning for selv at kunne sidde imellem guderne. Dette er en spændende trilogi, som skal læses umiddelbart efter Dragonlance chronicles (krøniker). Man følger brødrene tæt og er man Raistlin-fan er dette nogle bøger man ikke skal gå glip af. Det er svært ikke at blive opslugt i det spændende univers som er Dragonlance og det er nok en af de bedste fantasy serier der nogensinde er skrevet.